At Old Stone Vets we have invested in further equipment and skills CPD (Continuous Professional Development) and we can now perform TTA (Tibial Tuberosity Advancement) surgery on dogs large and small for ruptured cruciate. 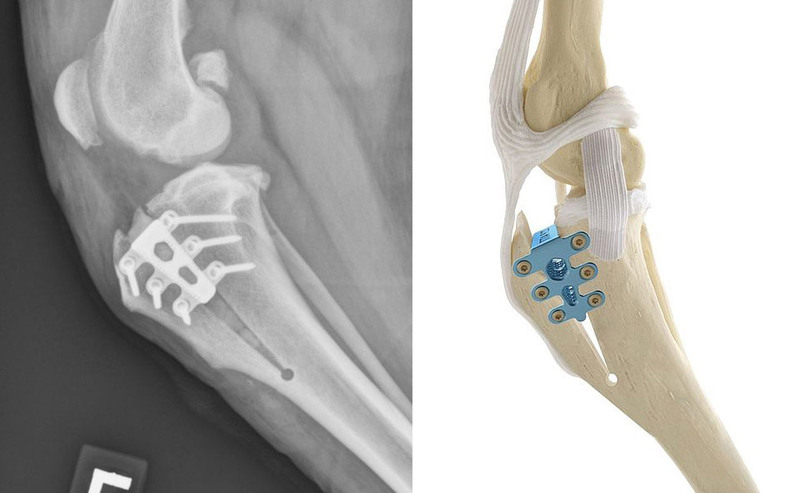 We use the latest Rapid TTA cages which minimalist damage to the tibia when performing the procedure. Cranial cruciate tears are a common cause of lameness in the dog. These tears are seen in many breeds and types of dogs but are generally a greater problem in the larger breeds such as Rotweillers, Labradors, Golden Retrievers/Boxers, Shepherds Mastiffs and Bull Terriers. They may present as an acute painful lameness or as a more gradual chronic lameness/soreness. There are in fact two cruciate ligaments in your dogs knee (stifle) joint. One goes from front to back the other from back to front. They form a cross in the knee and act as a point about which the knee hinges. Why did my dog’s cruciate tear? The exact reason is unknown. There are several factors involved including a weak or degenerative ligament and overloading of the ligament. Accidental causes of rupture/tear are the most common presentation. An important difference between a human knee and that of your dog is the weight bearing part of the tibia in the dog slopes backwards. This means the femur is constantly trying to fall or slide backwards and it is the job of the cranial cruciate to hold on or anchor the femur to the tibia. So even when your dog is standing the cruciate ligament is under strain. Once the ligament tears the knee then becomes very unstable and painful. The ligament is like a tight heavy duty elastic band. Sadly the ligament never repairs correctly, probably because of a poor blood supply and the ongoing action of the knee as the dog walks. What happens once the ligament ruptures? The general stability of the knee is lost and because the knee is then used abnormally degenerative changes begin which will lead to a progressive amount of arthritis and pain. Often dogs are seen with cruciate tears with a seemingly gradual onset of lameness that suddenly get worse. This is because the ligament may have stretched or torn over a period of time leading to more and more instability and more degenerative joint disease/osteoarthritis. The tibial tuberosity (the top part of the shin) is cut and moved forward then reattached to the tibia with custom made titanium implants. Effectively this changes the position of the patellar ligament relative to the tibial table thus removing the effect of the backward slope of the tibia, so now there is no need for the anchoring of the cruciate ligament. At Old Stone Vets, we have been performing TTA or MMP (Modified Maquet Procedure) operations for several years now with excellent results. Many dogs both working and pets make a full recovery to athletic ability often with little or no long term painkillers. 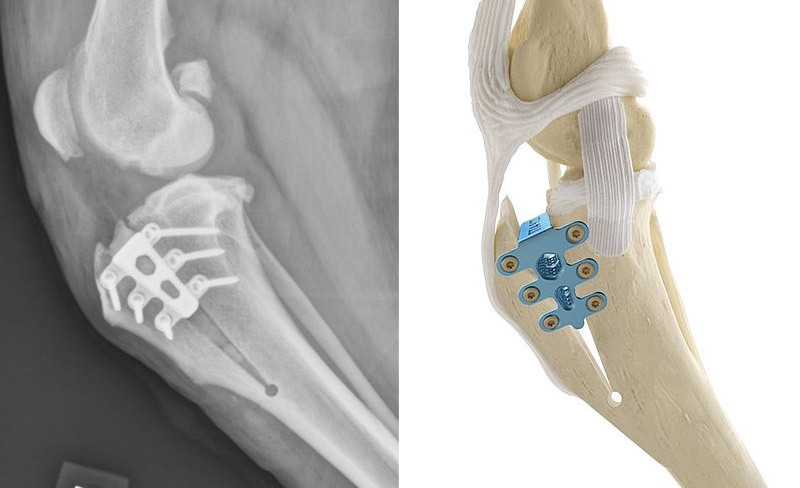 The other huge benefit from a TTA is there is significantly less degenerative joint disease and arthritis as these dogs get older compared to other treatments. This is the most important feature of TTAs. As a guide price, at our surgery a TTA operation including General Anaesthetic and Pre and Post Op X-rays is in the region of £1100-£1300 incl VAT. This price variation is form smaller dogs to larger dogs and based on medications needed as larger dogs require a lot of meds post operatively. The price includes post op checks at our surgeries. Cranial cruciate tears are a common , debilitating condition of the dogs knee. It will produce arthritis, pain and lameness all of which will progressively worsen with time. However with correct treatment and care we can now expect all our patients to exercise happily and enjoy a good quality of life.